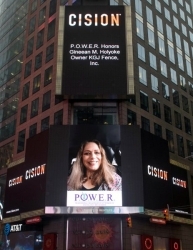 Norfolk, MA, January 05, 2019 --(PR.com)-- Gineean M. Holyoke of Norfolk, Massachusetts has been honored on the famous Reuters Billboard in Times Square in New York City by P.O.W.E.R. (Professional Organization of Women of Excellence Recognized) for her outstanding achievements and high level of success in the field of fencing contracting. Gineean Holyoke has over 30 years experience in the fencing industry. She is the owner of KGJ Fence, Inc., which provides fencing building, planning, installation, follow-up and repair services for residential, commercial, industrial and ranch fencing needs. The company has built privacy, security, slat, rail, chain link, ornamental and accent fences for almost 30 years in Massachusetts and Rhode Island. The company is certified through WBE as a Women’s Business Enterprise. As a Contractor, Gineean is responsible for providing job estimates, hiring installers, providing general office support and administration as needed and ensuring the best possible customer service. She is a member of the R.C.N.C. In her spare time, Gineean enjoys fishing, travel and public speaking. For further information, contact www.kgjfence.com and www.facebook.com/kgjfence/.